Need advice about a specific Mercedes-Benz E-Class problem? Chart based on 117 repairs. 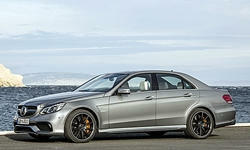 See TSBs and recalls for the 2014 Mercedes-Benz E-Class. Chart based on 65 repair trips. The repair cost chart excludes repairs made under warranty, do-it-yourself repairs, and repair trips that include maintenance. 35900 mi Failure of secondary systems battery leading to loss of cruise control, automated highbeams and other features. C $460 Front Caliper seized. This require replacement of both front rotors and the passenger front caliper. Brake pads changed as well due to new rotors. 11000 mi AC had an odor when first starting up. Replaced evaporator core and passenger compartment air filter. Cleaned the system with a foam cleaner. 16200 mi Took the car in for new tires and the dealer found a bushing that "looked distorted". They replaced the bushing and performed a four wheel alignment under warranty. I consider this fantastic service. 22000 mi Seat belt sensor flashed a warning "PreSafe inoperable, check owners manual". The warning went away but I wished to have it checked out. Sensor currently working properly but "saved" a record of the warning. Dealer ordering a new sensor just to keep the car "perfect". 8000 mi Rear window washer not working. It's a Station Wagon. 9000 mi Rear windshield washer was not working. Hose replaced. 14000 mi Interior rattles from trim and door mounted speakers. Felt applied and tweeters replaced. 25000 mi Check engine light came on. Tech read codes and unplugged the airflow sensor wire for 30 seconds. Reconnected wire with no check engine light since. No other issues in 25,000 miles. 17360 mi Blindspot information and lane assist stopped working. Three radar sensors replaced under warranty. 2000 mi Check engine light came up with error code for inconsistent Ambient Air Temperature and Intake Air Temperature readings. Service diagnosed the problem and replaced faulty Intake Air Temperature sensor. 28000 mi Rear cup holder locking mechanism will not latch. New part was ordered from Germany, waiting on replacement. Rear cup holder locking mechanism will not latch. Dealer replaced it with new cup holder. 36000 mi Outer transfer case bearing was making a noise related to speed. Dealer ordered and replaced entire transmission. There is a service program for all 4-Matic Mercedes relating to this issue due to tolerance stacking. 48000 mi Cargo cover magnet holder broke off. Dealer ordered and replaced cargo cover in trunk. 26200 mi Dealer replaced the center console lid (leather was lifting in the center. The dealer also replaced the aluminum trim on the Steering wheel due to bubbling along the edges. All covered under warranty. 6000 mi shifter became unresponsive after a few seconds of starting car. you'd have to select a gear quickly or you couldn't, nor could you select another. the only way to get back into park was by opening the door. trans needed a "software update"
9300 mi Oil line to turbo was leaking. Oil line replaced same day. 23000 mi Rough downshifts from 5th to 4th. Reset adaptable trans module. Did not fix. Similar issue with diffusers behind the dash that direct airflow that I had at delivery. Sound of springs popping from behind dash. Repeat fix. I suspect it will again be a temporary one. 26000 mi Rough downshifts from 5th to 4th and sometimes 4th to 3rd. There was a code stored in the system and the dealer was instructed by MBUSA to teplace the torque converter, which they did. This fix was not successful. 27000 mi Transmission slipping on accelerating downshifts, rough decelerating downshifts from 5-4 and sometimes 4-3. US $3000 Rotors and pad replacement. 15000 mi Key fob buttons and keyless system stopped working. Faulty antenna booster was the problem. 18000 mi Parktronic, Eco mode and Brake Hold features stopped working. Diagnosis - Auxiliary battery failed prematurely. 36000 mi Emissions repair approximately $6000 covered under warranty. I think the filters and nozzles that deliver the DEF were defective. 33000 mi Black paint on left side steering wheel control buttons peeling off. Part replaced. 39000 mi Seam came loose in upper part of driver side back cushion. Required replacement of cushion cover. 10000 mi Drivers seat cushion, uncomfortable. Lumbar adjustment lacks padding and side bolsters have no padding. US $550 Tire inflation monitor, lost signal had to replace. We hit something in the road and had to replace a tire. After the tire was replaced, they told us the sensor was defective so it was either the debris in the road or the installation of the tire that caused the problem. Otherwise a lovely car. 39000 mi Parking brake would sporadically not release. 48000 mi Drivability issues. Car would jerk and shudder upon acceleration intermittently. Diagnosed repair for new crank positioning sensor which was replaced. 48000 mi Second trip: Replaced the transmission control module. New torque converter installed. 48000 mi New transmission installed. Vehicle was returned today so too early to assess the fix. It was at the shop for roughly 10 days, but we were provided a loaner each time, so no problem. Fingers crossed. Dealership was very accommodating. 6000 mi CPO windshield wasn't properly installed causing a leak. It took nearly a month for them to receive the replacement windshield and repair it. Once received, they damaged body of car. US $700 Front drivers seat bottom replaced Had service manager take the car to replicate the wind noise coming from the front grill at 70mph Coolant leak from crack In coolant distribution pipe. US $400 DEF tank had shown empty even though the tank was filled by myself. Was unable to start car due to software, needed car towed to the dealer. Tank was checked for cracks and software was reset. US $547 Small crack in OEM wheel, leading to air leak. Replaced wheel. US $1500 Wheel alignment and tire replacement. Parts of driver assistance system failed, dealer said connections suffered damage from water and were frayed. System worked fine going in to dealership, returned broken. No reasoning giving by dealership. 28000 mi Auxiliary Battery (for ECO system) failed it's self test. This caused "restarts" to be seriously harsh, and other issues. 31500 mi Rattles in dash, steering column, and rear-view mirror. The mirror resolved itself, the others not so much. The car is now out of it’s OEM warranty, and has an aftermarket warranty until 150K miles. The ONE thing that doesn’t cover is interior rattles. UGH. 14880 mi Power windows stopped working. Three days later they started again. Visit to dealer was to get a software update. 18000 mi washer motor did not operate and had to be replaced. 5000 mi Aux battery malfunction warning. 40000 mi The "Pre-Safe" system detected a fault which ended up being a faulty passenger-side seatbelt mechanism. The belt worked no problem, so the issue was with the "pre-safe system" with regard to this seatbelt. 15000 mi Excessive wind noise. All door seals replaced at dealers cost. May have had expectations too high being a E class MB. Better but still hear some noise. Feb 2014 Reverse Cam froze and guided lines disappeared. 4000 mi Power steering failed & warning light came on. 38000 mi Bad center speaker covered by warranty. Apr 2014 Automatic trunk lock did not latch. 9000 mi Driving on an interstate highway the car shut off. The dealer has not been able to identify the problem. Keyless door locks did not work always. I have asked the dealer to replace the car, but no response. MB USA is replacing the car. 6300 mi Navigation went out dealer could not fix. Navigation would go out when there was a daylight savings time change. It would go out and then all of a sudden it would come back on. Dealer had no idea what the problem was. Update: later fixed itself. 7000 mi Jerks between 1st and 3rd gear and 4th to 5th gear. Have had this problem since I received the car. They have no solution for it except to reprogram it and that only lasts for about a month and then it goes back to old routine. Worst trans in any car I have ever owned. According to MBUSA they are aware of the problem but have no solution for it. 11225 mi Navigation went out again. They replaced the antenna then the cable then the head unit. After they replaced the head unit and reloaded the unit with the most updated info the unit finally worked. They also disconnected all my aftermarket stuff and rewired the aftermarket stuff wrong. When I got car home the next day it was dead. Found out they wired the radar system so it was on all the time. It took me about 3 hours to sort through what they messed up and straighten out. US $125 aux battery in trunk went bad. 77000 mi The "KeyLess Go" ignition switch was replaced. The faulty switch was draining the main battery overnight. Repaired under warranty. US $1100 Replaced control sensor of the lane detection alert and adaptive cruise control. 1500 mi There was a piece of wood trim missing from the dashboard under the instrument cluster. MB and the dealer claimed it was a "mid year design change" and that there was nothing wrong. I don't believe them. 5000 mi Main computer malfunction requiring a new wiring harness, Car was driveable, continued on trip and visited hometown Mercedes dealer who repaired satisfactorily. 2000 mi Pre-safe/Distronic sensor failed. Diagnosed, replaced, repaired. 20500 mi Car continually displaying "Check Washer Fluid" while it was full. 15000 mi Very minor squeaking/cricket noise that varies with engine speed. Dealer said loose glove box adjusted, but noise still present. 45000 mi The "Check Engine" light came on. The dealer determined that an oxygen sensor in the emissions system was at fault. The part had to be ordered and put in on another day. All was covered under warrantee. US $272 The Auxiliary Battery malfunctioned and required replacement. The Command Module that controls the display for audio/video/nav malfunctioned and required replacement. 22000 mi Second key would not work. Brace buttons would not work. 30800 mi Back up camera dynamic guide lines went missing, and fixed by software reprogram. 45000 mi "Easy access steering movement out of the way mechanism stuck up" Sticking parking brake in cold weather. 60000 mi The cars had hesitation and shuddering. The check engine light came on. The car was diagnosed with a faulty fuel injector. The high pressure fuel pump was leaking oil into the fuel system, so they had to replace all injectors, the fuel rails, and the high pressure fuel pump all under campaign at no cost to me. 17500 mi check engine light came on, slight misfiring occurring -- CEL at first flashing, then a solid light w/out misfiring. Dealer did software upgrade to remedy issue. 21000 mi Auxiliary Battery Malfunction - replaced under 4/50k new car warranty. 33000 mi There was a cracking sound coming from the left rear of the panoramic sunroof every time the car goes through a curb in an angle. R/R complete headliner to inspect. Removed panoramic sunroof glass and guide rails. Cleaned and re-torqued complete panoramic glass assembly. Connected and disconnected SDS and battery charger to normalize panoramic sunroof. 34000 mi Exterior door handle for front passenger side was replaced. Sensor was bad. Could not lock or unlock that door with the key fob within 3 feet from the door. 37000 mi The parking brake doesn't release on its own I had to help it with my left foot. It was really a problem especially on very cold days. Parking brake assembly was replaced. This was done under the CPO warranty. 12000 mi HVAC Blower failure. Blower and circuit board replaced. 12000 mi Auxillary Battery Malfunction reported on dash. ECO system and Distronic would not work. Auxilary Battery failed diagnostics and was replaced. 24000 mi Leather on the drivers seat began to crack. US $525 Front passenger control arm needed camber bolt to get into alignment. Additionally front brakes had to be replaced, Auxilary battery needed replaced and a software update to fix the steering wheel motor. 52000 mi Clutch kit in transfer case had to be replaced twice. First time vehicle was in the shop for 48 hrs the next time (7-10 days later) a full week. See our lemon odds and nada odds page to see vehicles with no repairs or vehicles with more than three repairs. To see how frequently 2014 Mercedes-Benz E-Class problems occur, check out our car reliability stats.